If you based becoming a detective on shows like Law and Order or True Detectives, then you may want to reevaluate your vision. While being a detective might be an exciting career, it’s nothing like how it’s portrayed on television. Hollywood dramatically enhances detective careers but, in real life, you wouldn’t be involved in thrilling cases daily. 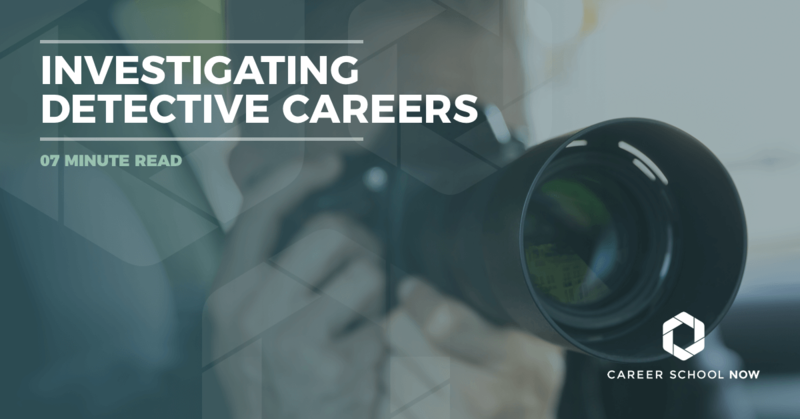 Let’s take a realistic approach to what detective careers are like and how to become a one. Detectives are either public or private. A private detective is usually ‘for hire,' working directly with the public instead of going through a law enforcement agency like police detectives have to do. Detectives are sworn law enforcement officers who conduct criminal investigations. Essentially, a detective is highly trained to solve crimes, whether a felony or misdemeanor. Detectives aren’t usually in uniform, they operate in everyday street clothes and drive in unmarked cars. They are always armed with a weapon, though. Due to the nature of their job, they have to carry a gun. Ranking higher than a police officer, the police detective earns a higher salary reflective of the position. Because of that, police detectives also require a higher level of education and training. All detectives start out as police officers which is mandatory before being considered for a police detective position. Piecing together the story/case though investigative actions. Detective assignments can include undercover narcotics, juvenile crimes, internal affairs, robbery, family violence, and homicide. Get a degree. An associates is the minimum, but a bachelor’s degree in law enforcement, political science, or criminal justice is recommended. Complete police academy. A lot depends on what jurisdiction you’re in, but police academy lasts, on average, six months. Get fit physically and mentally. You’ll need to pass tests measuring both your physical and mental health. To go on from a detective to become a sergeant, lieutenant, or captain, you must have five years of work experience, along with a satisfactory record. Multi-tasker: As a detective, you’ll have a lot going on at one time, and you’ll need to be able to balance it all. Communication: You will need to be able to speak clearly and effectively to all parties involved with your case. Writing skills: Part of your workload will be writing. You need to be a good writer to create understandable and detailed case reports. Detail-oriented: You need to pay close attention to crime scenes while absorbing even the most minute detail. Patience: Unless you get pretty lucky, cases can take months or even years to be solved. Deep breaths. Strength and stamina: In a detective’s line of work, physical force is inevitable. Physical strength is important to the job. Empathetic: Detectives have to work with victims and the families of victims during sometimes horrific times. Maintaining a perspective will allow you to stay empathetic to them. Good judgment: Making a judgment call can sometimes create a life or death situation. Good judgment is paramount. Leadership: Detectives head up investigations, and people look to them for guidance. You must be 21 years old, a United States citizen, and pass a background check. You’ll need to have gone through a police academy, and have police officer experience, as well. Educational requirements vary by state, some have a minimum requirement of a high school diploma or GED, while other departments require a minimum of an associate’s degree in criminal justice or related fields. Obtaining a bachelor’s degree will help with quicker promotions. You’ll need a clean record, and a valid driver’s license, as well. Also, to be hired as a detective, you must be physically fit and pass a fitness test, not to mention a drug and polygraph test. Hearing, vision, and psych evals are also required if you want to work as a detective. If these tests aren’t taken or passed, you will not be able to be hired as a detective. Becoming a police officer only takes about six months. Becoming a detective takes longer due to the time and experience requirements that need to be fulfilled. You’ll need to have a minimum of four to five years on the force before being eligible to take the detective promotion exam. Some police departments will allow a college degree to replace one year of experience. To work as a private investigator, you do not need to first be a police officer. Each state has its own licensing requirements to work as a private investigator. Private investigators work for law offices, corporations usually under a contract, or they can be self-employed. There are no educational requirements to becoming a private detective, nor is there any law enforcement experience necessary. You may still want to consider getting a degree in criminal justice or law to create better job opportunities for yourself. Private investigators earn an average salary of over $45,000 which is significantly less than what police detectives make annually. Cyber-crime detectives help to solve Internet-related crimes. They may monitor chat rooms for crimes against minors, investigate identity theft crimes related to the internet, and identify scams. Cyber-crime detectives may take extra courses in different computer-related areas to help broaden their base of knowledge. Homicide detectives work on cases where there has been a death and foul play is involved. Generally, one detective will head up a team of two or more other detectives put on the case. Crime scene investigation, interviewing witnesses, working with the local prosecutors, and appearing in court are all parts of the homicide detectives job duties. Narcotics detectives are on the case when drugs purchases and sales have been involved. They work on all levels; local, state, and federal, identifying drug-related crimes. The narcotics detective may go undercover for extended periods of time in order to build a case against a drug dealer. Cold case detectives try to solve cases of missing children and adults. Also, unsolved cases are given to the cold case detective to work on. They work at all levels of government, reviewing the case files, interviewing detectives and others originally on the case, in hopes of solving these cold cases. Between now and 2024, a slow growth of 4% is expected for detective careers. While this is slower than most other occupations, there will still be a need for detectives, but it’s more dependent on the precinct. Those with bachelor’s degrees, law enforcement or military experience, and who are bi-or multilingual should have the best opportunities. The Bureau of Labor Statistics reported the median annual wage of detectives to be $60,270 in 2015. This annual wage is the average based on all reported salaries. The lower 10% earned an average of $34,170 while the top 10% of all detectives earned $100,560 per year. Detectives have excellent benefits, and they have an early retirement option, as well. Most officers, police, and detectives, belong to their local unions. You Want To Be A Firefighter? Learn How!